The Killington Selectboard receives a check for $15,000 to continue beautification efforts. Pictured (l-r): Patty McGrath, Selectboard chair; Chris Bianchi, Selectboard member; Ken Lee, Selectboard member; and Vince Chiarella, treasurer of the Killington Pico Area Association. 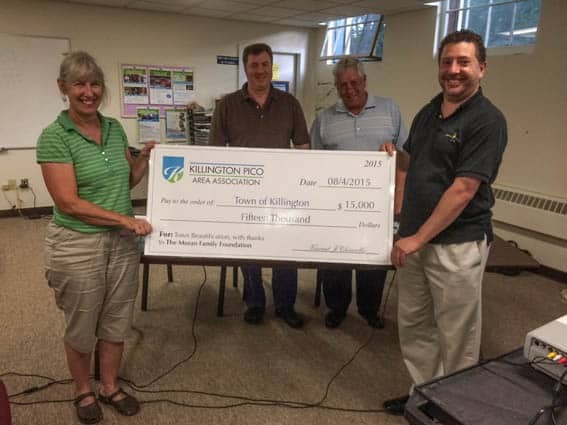 KILLINGTON–The Killington Pico Area Association (KPAA) has received a $15,000 gift toward continued beautification efforts in Killington. The gift from the Moran Family Foundation was presented to the Town of Killington’s Select Board on Tuesday, Aug. 4 by KPAA treasurer Vince Chiarella. “Killington is a special place for our family and we wanted to support its redevelopment as four season destination,” said Kate Moran of the Moran Family Foundation. “We’re hopeful our contribution can help the community continue its beautification plans in the years to come,” she added. The KPAA worked with the Moran Foundation to target giving toward the aesthetic development of Killington. The town will hold the contribution in a restricted fund and coordinate with the KPAA and Moran Foundation on the implementation of it. The KPAA plans to solicit more donations and build on the Moran Foundation contribution. The organization has begun raising money to support future plantings and enhancements. The Moran Family Foundation was created to support a broad range of programs. These programs include the development and strengthening of local communities. The foundation believes in helping to enhance the economic growth while continuing to preserve the natural beauty of the region. The areas are chosen based on a personal connection to the members of the Foundation.